Survivor, originally uploaded by The Bacher Family. Michael is a good friend of our family and the best friend of my son, who's slowly and painfully recovering from a bone marrow transplant. While his general progress has been positive, he's had numerous setbacks, some of which have required massive doses of steroids to combat. The steroids make his face puffy and dissolve his bones, leading to a lot of pain in his joints, yet Michael has remained positive and hopeful throughout his ordeal. 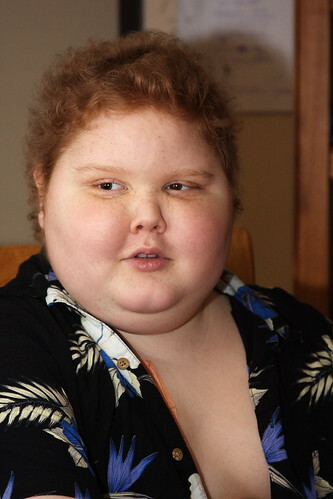 I took this portrait of him at Ronald McDonald House in Seattle. An interesting side note: Michael's hair, formerly straight, has grown in curly! Makes you wonder if there's some bone marrow donor out there in Germany with curly hair! Here's a photo of Michael with my son David. I have a great fast lens that allows me to take pictures in really low light; unfortunately, it sometimes uses a very narrow depth of field, and I don't see the lack of focus until I bring the picture home to my computer. I need to remember to watch my f-stop more closely! Friends no matter what, originally uploaded by The Bacher Family. Those open apertures are great for light but killer on the DOF front. I've been tripped up by the same problem. Been toying with the idea of various solutions but my fave so far is put it on aperture priority and see where you get to. I wish your son's friend a safe and speedy recovery, and that he enjoys his newly curly hair.